U.S. President Donald Trump on Tuesday sanctioned the wife of Nicaraguan President Daniel Ortega and one of his aides under a new executive order allowing Washington to target Nicaraguan officials for a crackdown on anti-government protests. The U.S. Treasury said it had used the new executive order to punish Nicaraguan Vice President Rosario Murillo, Ortega's wife, and an aide it named as Nestor Moncada Lau, accusing them of undermining Nicaragua's democracy. There was no immediate response from the Nicaraguan government for a request for comment on the U.S. action. 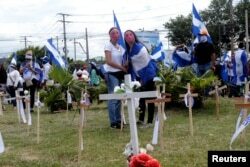 FILE - Demonstrators stand next to crosses at a memorial for victims killed in recent protests against Nicaraguan President Daniel Ortega's government, during a protest in Managua, Nicaragua, Aug. 4, 2018. U.S. officials said they were trying to influence Ortega, a former Marxist guerilla leader whose response to the protests has been compared to the reign of Anastasio Somoza, the dictator he helped topple in 1979. "It's a message to President Ortega to find an exit strategy and to begin a process for ... free and fair elections," a senior Trump administration official told reporters on condition of anonymity. "It's an opportunity to find some type of solution ... to the crisis that they have created." Ortega, who ruled the country from 1979 to 1990, has held elected office as president since 2007. The current violence comes after years of calm and is the worst since his Sandinista movement battled U.S.-backed "Contra" rebels in the 1980s. In announcing the sanctions, the Treasury accused Murillo of dismantling Nicaragua's democratic institutions and looting its wealth in an effort to consolidate power. It described Moncada as acting as a national security adviser to both Ortega and Murillo. While he does not have an official position in the government, he is believed to have considerable influence over the police. Moncada's involvement in intelligence operations with the Sandinista party stretches back to the early years of the revolution in the 1980s.